There are two ways to fight back against depression that do not involve pharmaceuticals. The first is to write my way through the experience (but that's a subsequent post). The second is to imperil my personal tech infrastructure. These are my friends, whose existence and obedience I have purchased with credit card. 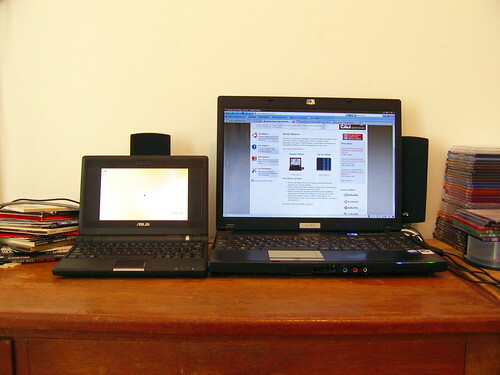 The larger of the two is my MSI laptop, which is a respectable enough beast: 1.86 gHz Core Duo processor (note that there no claims to a 'dual core' processor), 1 gigabyte of RAM, 100 gigabytes of hard drive tucked inside. It came packaged with Windows Vista, which I've managed to tweak to my liking. 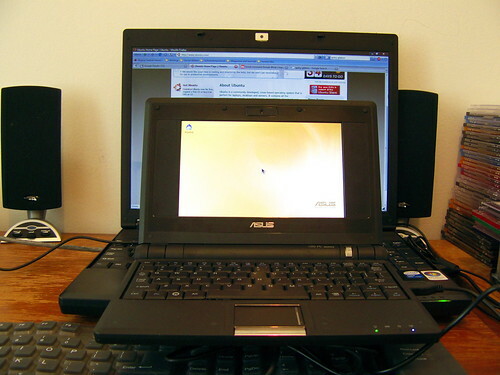 The smaller computer is the plucky underdog of the two, an Asus eee with 512 megabytes of RAM and a 4 gig flash hard drive. It's my portable computer, the one that I throw in my shoulder bag and take out to coffee shops. People's brains short circuit when they see it in action. If I were single, my eee would be on the front lines of Mission Getting Me Laid. Anyway, my weekend project involves installing Xubuntu Linux on my eee. Right now it runs Xandros Linux, which runs well enough, but the options for software are limited. And ever since I was a child, I've nurtured a dream of swapping out a K Desktop Environment for a GNOME-based environment. True story! I have no clue what I'm talking about!